This was when you could still buy the Apple II as a kit with just the motherboard. Also the floppy drive wasn’t released until the year after this ad. The home computer that’s ready to work, play and grow with you. Clear the kitchen table. Bring in the color T.V. Plug in your new Apple II? and connect any standard cassette recorder/player. Now you’re ready for an evening of discovery in the new world of personal computers. Only Apple II makes it that easy. It’s a complete, ready to use computerâ€”not a kit. At $1298, it includes features you won’t find on other personal computers costing twice as much. Features such as video graphics in 15 colors. And a built-in memory capacity of 8K bytes ROM and 4K bytes RAM â€”with room for lots more. But you don’t even need to know a RAM from a ROM to use and enjoy Apple II. It’s the first personal computer with a fast version of BASICâ€”the English-like programming languageâ€”permanently built in. That means you can begin running your Apple II the first evening, entering your own instructions and watching them work, even if you’ve had no previous computer experience. The familiar typewriter-style keyboard makes communication easy. And your programs and data can be stored on (and retrieved from) audio cassettes, using the built-in cassette interface, so you can swap with other Apple II users.This and other peripheralsâ€”optional equipment on most personal computers, at hundreds of dollars extra costâ€”are built into Apple II. And it’s designed to keep up with changing technology, to expand easily whenever you need it to As an educational tool, Apple II is a sound investment. You can program it to tutor your children in most any subject, such as spelling, history or math. But the biggest benefitâ€”no matter how you use Apple IIâ€”is that you and your family increase your familiarity with the computer itself. The more you experiment with it, the more you discover about its potential. to create beautiful kaleidoscopic designs As you master Apple BASIC, you’ll be able to organize, index and store data on household finances, income tax, recipes, and record collections. You can learn to chart your biorhythms, balance your checking account, even control your home environment. Apple II will go as far as your imagination can take it. 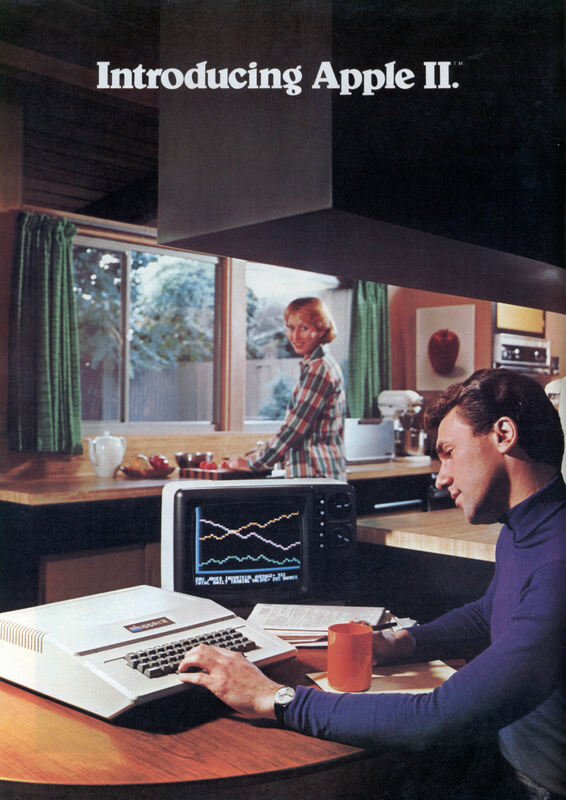 Best of all, Apple II is designed to grow with you. As your skill and experience with computing increase, you may want to add new Apple peripherals. For example, a refined, more sophisticated BASIC language is being developed for advanced scientific and mathematical applications. And in addition to the built-in audio, video and game interfaces, there’s room for eight plug-in options such as a prototyping board for experimenting with interfaces to other equipment; a serial board for connecting teletype, printer and other terminals; a parallel interface for communicating with a printer or another computer; an EPROM board for storing programs permanently; and a modem board communications interface. A floppy disk interface with software and complete operating systems will be available at the end of 1977. And there are many more options to come, because Apple II was designed from the beginning to accommodate increased power and capability as your requirements change. If you’d like to see for yourself how easy it is to use and enjoy Apple II, visit your local dealer for a demonstration and a copy of our detailed brochure. Or write Apple Computer Inc., 20863 Stevens Creek Blvd.,Cupertino, California 95014. Apple IIâ„¢ is a completely self-contained computer system with BASIC in ROM, color graphics, ASCII keyboard, lightweight, efficient switching power supply and molded case. It is supplied with BASIC in ROM, up to 48K bytes of RAM, and with cassette tape, video and game I/O interfaces built-in. Also included are two game paddles and a demonstration cassette. â€¢ Textâ€”40 characters/line, 24 lines upper case. â€¢ Both graphics modes can be selected to include 4 lines of text at the bottom of the display area. â€¢ Completely transparent memory access. All color generation done digitally. Apple II plugs into any standard TV using an inexpensive modulator (not supplied). Ouch! The Apple ][ was NEVER available as a kit, the product was always intended to be a plug & play computer in a plastic case. The Apple 1 was available as a circuit board for which the user had to supply many of the parts, including the case. Better fix that before someone Diggs this and you have your server flooded by other Apple geeks pointing out the error. When I said kit, I meant you could buy just the motherboard and build your own case, power supply etc. It says it on the lower right corner of the ad. Are you saying this option was never actually available? Charlie posted this article as a favor to me, so I’m getting a kick out of these comments. I worked at a small computer store in ine 1980s & 1990s. Every once in a while we would sell an Apple //e board alone to some company, proportedly for CNC use. I purchased one of the first (sn 000105) ][ in El Paso in 1970-something or other. Can it have been 76? (That’s the spirit!) I got the floppy drive several months later. Up until now, never heard of the ‘board-only’ option. That part of the ad may have been retroactively negated. And since 1985, I haven’t done squat! You guys should check out that video jayessel did on the apple II it’s pretty amazing. I remember when those computers came out. I remember when Pong came out, too. In our school we got new Apple IIe’s, and we thought it was SO much fun to play the original version of “Oregon Trail” in school. Actually I think it’s still fun. Now instead of playing Oregon Trail to waste time in school, my girl gets to go on the Internet and play educational games- which I still think is a waste of time. I don’t call catching letters to form a word very educational, at any level. I had been an OS programmer on mainframes from 1973 thru 1978. Actually, I think she’s cutting apples. Also, note the contents of their art. I’ll post the Super-8 epic eventually. I have a bit part in it! The rig is still there. By the way, I found conductive strips and photo sensors for advancing the film and positioning the color filters unreliable. The last version used low RPM, high torque AC gearmotors and lever-action microswitches. I may post one more picture. The 33: Liz Damon’s “Orient Express”. I always loved the ominous black monolith overlooking the scene in this ad. In my copy, I remember the guy had a huge multicolored ink splotch across his face. Remember the Apple ][ ad from June 14, 2007? See if you can spot the CG! That’s me “Live from Earth”! jayessell » Why on earth would that be against the rules? The only things that aren’t allowed are hate speech and blatant spam. And on the spam front, if you’re a regular commenter to the site (and you’re among our most prolific) I really don’t have any problem with you posting whatever you want. If you have a new site, or book, movie, or whatever that you want to plug, go right ahead. That goes for everyone. I’d like this to be a community and not everything has to revolve around the stuff I post. Also, I’m thinking of adding forums to the site, what do you think? The Apple II was originally available for sale as a motherboard only or a full package (with case, keyboard, power supply, accessories). 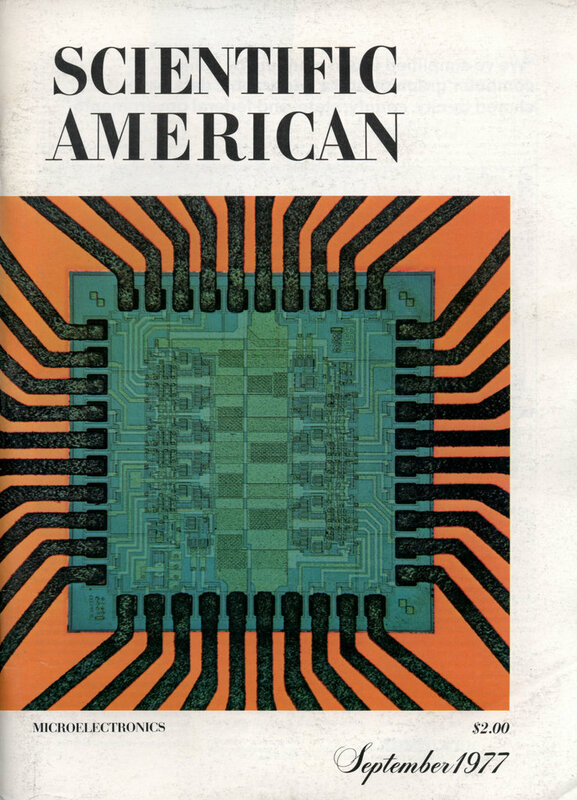 I worked for one of the first computer stores in New York City and while we never sold any individual motherboards (the primary market was business customers) it was in the Apple catalog – I’ve still got an October 1977 price list in my archives. The motherboard-alone wasn’t a true “kit” for computer geeks of the time – a kit meant getting a blank motherboard and populating it with chips and soldering everything yourself. Having the motherboard already populated and just needing to find a power supply, compatible keyboard and case was a bit too simple. In a very real sense buying an Apple II motherboard by itself was similar to folks who buy motherboards today to assemble their own computers. I did have one customer who would purchase Apple IIs from me and ask me to disassemble them into components (separate keyboard, case, motherboard, and power supply). He would send the parts to Brazil (which had a very high import tariff on pre-built computers, but a low tariff on computer parts) where a tech would put the parts back together. That’s the closest our store ever came to selling an individual motherboard. I have a rev 0 “kit” from 1977. My Apple II rev 0 board was purchased from the original Byte Shop while they still had an Apple 1 demo for sale! The “kit” boards were made from the very first production run of II’s. Mine is hand numbered 1-462. Interesting to find out from Woz who actually numbered this run?